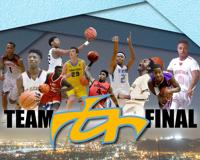 TEAM FINAL is one of Nike's premier AAU Basketball teams in the Mid-Atlantic region. They have rich history of producing division one top prospects as well as professional NBA level talent. Come watch the top High School players from the best AAU Programs in the Northeast battle it out of the hardwood as the prepare for their upcoming travel season.